On Sunday, May 22, 2005, the Crystal Lake Historical Society honored Civil War soldier, Orlando Wells Nash, with a headstone dedication ceremony to mark the final resting place of this Crystal Lake veteran. Orlando Wells Nash was born October 22, 1839 in Ohio. He was the son of Enos B. and Catherine Keller Nash. The family moved to Illinois in the 1840’s, and eventually settled in Crystal Lake, Algonquin Township. In September, 1861, at the age of 22, Orlando left his family farm and enlisted for a three-year term in the Illinois 36th Infantry Regiment, Company H at the rank of Private. Company H was commonly known as “The Woodstock Rifles.” The 36th Infantry Regiment wintered in Missouri, and proceeded into Arkansas to fight at the Battle of Pea Ridge in March, 1862. The Regiment then moved on to Kentucky and was involved in several skirmishes, including the Battle of Perryville. On November 14, 1862, Orlando was promoted to the rank of Corporal. By December, 1862, the 36th Infantry Regiment had moved to Murfreesboro, TN. And on December 26th became engaged in the Battle of Stones River. On December 31, 1862, Orlando Wells Nash was killed at the Battle of Stones River. Several weeks after the Battle of Stones River, a small group of local citizens, led by Mr. John Brink, traveled to war-torn Tennessee to claim the bodies of Orlando Nash and Al Bunker (of Ridgefield) and bring them back to McHenry County for burial. In February, 1863, church services for Orlando Nash were held at the First Congregational Church, and he was laid to rest at the Crystal Lake Cemetery (now known as Lake Avenue Cemetery). 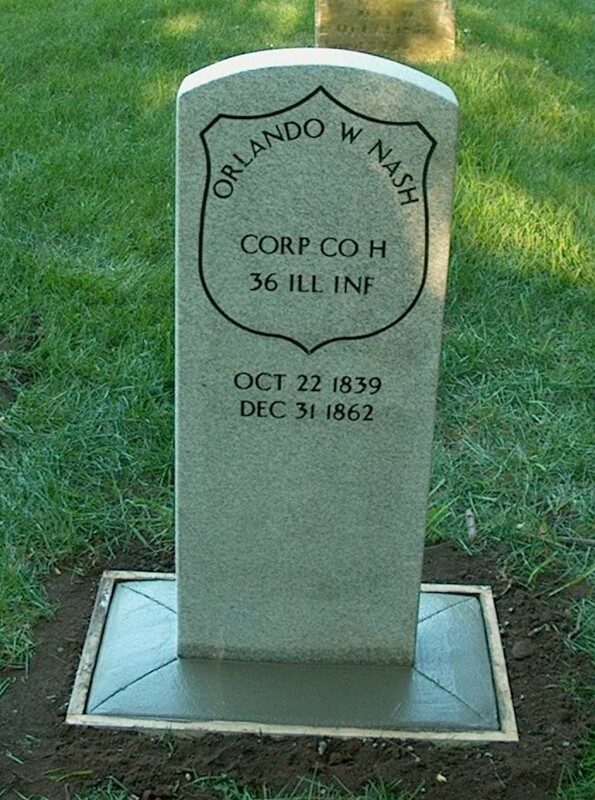 It is unknown if Orlando Nash’s grave ever had a headstone; but the new government-issued Civil War era headstone will now mark the final resting place of this Civil War soldier, who died defending the Union. 1 The original copy of Pvt. John H. Sackett’s letter is located at the Abraham Lincoln Memorial Library, Springfield, Illinois, Manuscript collection. 4 The original diary of Martha Josephine Buck is owned by her great-grandson, Stanley Jones.